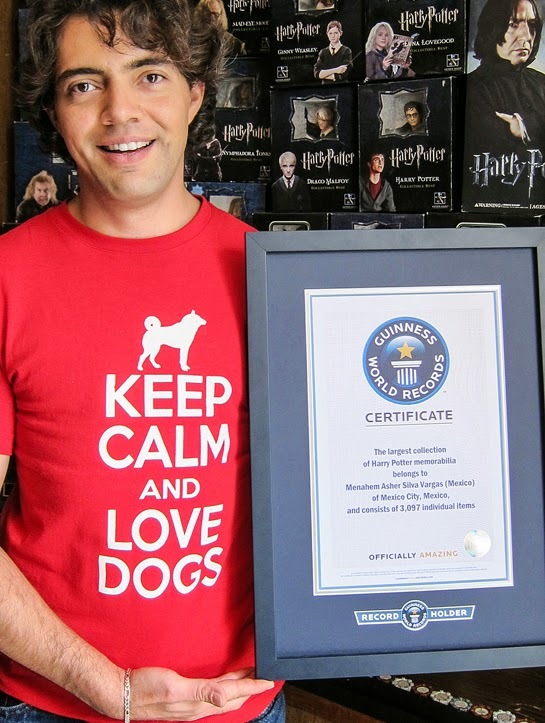 It took 15 years for Menahem Asher Silva Vargas to break the Guinness World Record, but now, not even Voldemort can stop him: The 37-year-old Mexico City lawyer is the proud owner of the biggest Harry Potter collection in the world. Vargas started collecting in 1999 when he bought his first piece of memorabilia, an exact replica of Professor Dumbledore’s wand. Now, 3,096 items later, he’s crushed the previous record of 807. When I met Vargas, he was pacing down Colonia del Valle, a tree-lined neighborhood in Mexico City, wearing a fire-engine red shirt that reads: “Keep Calm and Love Dogs.” He waved hello and, after brief introductions, led the way through a garage, a courtyard and into his mother’s guest house, a one-story building with two rooms and thousands of pieces of Harry Potter memorabilia. Actually, the number of items related to the fictional boy wizard is larger than that counted by Guinness, closer to 3,500. Vargas has a very thorough inventory of all his items — which includes 40 wands, 67 books and more than 1,500 collector’s cards — to prove it. But when Guinness tallied up his collection, it used strict guidelines about which items constituted memorabilia. Autographs, newspaper clippings and articles didn’t qualify. Since September, when Vargas was officially recognized as the record holder, his collection has gone viral, and he’s been caught up in a whirlwind of media attention interested in getting a glimpse of the rooms stacked from floor to ceiling with merchandise. To my right was a wall of collectible busts. It was overwhelming, all those Dumbledores and Voldemorts looking down, sneering from their pristine packaging. To my left was a bookcase filled with books, board games and Bertie Bott’s Jelly Beans, which Vargas collects rather than eats (little wonder, as the jelly bean flavors include dirt, earwax and earthworm). A day after my visit, the collection would relocate to a storage unit with premium conservation conditions: optimal air circulation, maximum climate control and 24-hour security. But that’s tomorrow; on this day, Vargas pulled up chairs for us to sit among his impressive collection and began chain-smoking Delicados. “This all goes tomorrow,” he said, exhaling a gust of smoke and motioning toward the stacked memorabilia, not a piece of wall in sight. He hopes eventually to raise enough money to start a museum. It all started 15 years ago when a friend lent “Harry Potter and the Sorcerer’s Stone,” the first book of the fantasy series by J.K. Rowling, to a 22-year-old Vargas. He was going through some difficult times, so he spent most of his days and nights at a local coffee shop in Mexico City. In one caffeinated sitting, Vargas finished the entire book. “From that moment, I was hooked,” he said. Estranged from his father, Vargas completely identified with the fictional wizard’s parental absence. Although officially a collector for 15 years, Vargas made a decision to take his hobby to the next level eight years ago. “This is my legacy,” he explained. All his income went to the collection, every last penny. He eventually started trading professional consultations in exchange for Harry Potter artifacts. So his wife, Rocio Hermida, also a lawyer, became the breadwinner to support his habit. As it turns out, Vargas’ most precious artifact didn’t cost him any money. “There,” he said, pointing to a gold-framed wall mount with Harry, Ron and Hermione’s faces encased in glass. His mother made it for him from a T-shirt their gardener gave him, but because it’s not technically merchandise, it wasn’t part of the 3,097 items registered with Guinness. Regardless, it’s the item with the most sentimental value. He hopes that his public recognition will help rekindle his relationship with his father, who is a practicing lawyer in San Diego. Especially on his mind is his half-sister, with whom he’s lost contact. “She must be 11 years old now,” he said. Besides collecting, Vargas is a dog enthusiast, hence his shirt. To date, he’s rescued more than 100 homeless dogs, and at the time of this visit was sheltering 15. A few months previous, Vargas’ next-door neighbor locked a dog on the scorching balcony with no shade, food or water. To save the dog that was virtually abandoned, Vargas and his brother planned a rescue mission. The dog was skin and bones by the time they got him to the vet, but once restored back to full health, there was no question what they should name him: Harry.